Well I made a pasta for lunch today when I should have been doing my Musicals essay. Here's the recipe. Basically I was trying to use up all the little bits and pieces that were sitting in the fridge. It was really really good. Like very very very nice. I'm going to make it for the family tomorrow night. These quantities are for 1 person (i.e. me, a girl with a big appetite and an obsession with chilli, garlic and anchovies) but you can adjust them to taste. And I served it with some torn cos lettuce with a bit of oil and vinegar drizzled over. Boil 125g penne pasta. 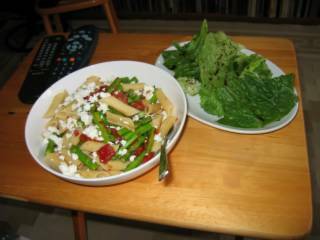 Steam 1 bunch trimmed and chopped (same length as penne) asparagus over pasta for 3 minutes. Heat oil, 2 cloves crushed garlic and 2 chopped chillies (don't deseed unless you're a wuss) with 3 anchovy fillets in a pan. Stir around until anchovies break up into mush and the pan is fragrant. Add a small handful chopped up semi-dried tomatoes and stir around. Tip in asparagus and stir to coat in the fragrant oil. Turn off the heat. Add drained pasta to the pan and stir around to distribute the asparagus evenly. Tip into a bowl and crumble over feta cheese (and some chopped parsley if you've got it) Eat with a fork, on the couch in front of the TV or computer.